Review: Imagine your friend betrays you or your friend wishes you away forever. Faerieground Wish by Beth Bracken and Kay Fraser is an exhilarating read with mystical creatures like fairies. It shows two perspectives, one in captivity, one trying to save the character in captivity. Test your self while reading. Would do the same for your best friend. Soli and Lucy are best friends, and Soli is always in the shadows. Soli is quiet; she thinks this boy likes her and she likes him back. But one day she catches Lucy and him kissing in the hall and when Lucy tries to explain what happened, Soli wishes her away and the story of two friends begins. 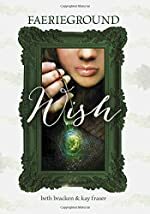 Faerieground Wish by Beth Bracken and Kay Fraser is a story that adds a lot of fantasy to some reality and gives the reader a big thrill. It includes problems kids might have, as they get older. I give this book 5 stars because it provides the reader an actual place to see and imagine and immerses the reader in mystery. I would also recommend this book for girls in 7th grade through sophomore year of high school, because of the more mature story line. Over all Faerieground Wish is an excellent book. Have fun reading!